You’ll find peace, quiet, and privacy at our secluded cabins in Pigeon Forge and Gatlinburg. At your private cabin in the mountains, you can enjoy scenic settings that immerse you fully in nature. With no loud noises and traffic, you can enjoy plenty of quality time with your family and friends! Best of all, while these secluded cabins are tucked away, you’ll never be far from fun attractions in the Smokies. Enjoy the beauty of the Smoky Mountains of Tennessee with a log cabin rental complete with mountain views and luxury amenities for a vacation you won’t soon forget! Find a peaceful cabin for your group retreat, family getaway, or romantic trip today! Find your solitude in one of our secluded cabins in Pigeon Forge or further out in one of our Smoky Mountain private cabin rentals. We aim to provide you with some of the areas most secluded cabin rentals for your cabin stay. While our secluded Pigeon Forge cabin rentals provide tranquil settings, they don't take you too far from the fun and adventure Pigeon Forge offers. Our area Smoky Mountain private cabins, a little further from downtown Pigeon Forge, are nestled in scenic areas such as Wears Valley. If you're looking for a great Smokies experience, it's hard to beat booking one of these rentals. After a great day of winter hiking in the national park or exploring rides at Dollywood, you'll love returning to your cabin that's hidden away in a secluded spot. Whether you're looking for a Gatlinburg secluded cabin or a private cabin in Pigeon Forge, we have plenty of locations to choose from! Book Online with Cabins USA and SAVE on your secluded Smoky Mountains cabin rental! Have you considered a Private Pool Cabin for your vacation in the Smokies? Interested, check out our private in-cabin pool rentals and see why so many Smoky Mountain visitors choose a cabin with its own indoor pool. Your private honeymoon cabin in Wears Valley, “Ain’t No Mountain High Enough,” is a romantic Tennessee cabin rental minutes from action packed Pigeon Forge! Looking for a Waldens Creek cabin rental in Laughing Pines Resort, Heart To Heart cabin is a 1 bedroom cabin sleeping up to 4 guests with WiFi Internet. Come stay at Sky High Hobby cabin where you'll get to enjoy a honeymoon cabin with hot tub, jacuzzi tub, and more! Searching for a private Smoky Mountain honeymoon cabin in Tennessee, check out A Peaceful Getaway cabin and immediately save when booked online! Reserve your own affordable, secluded cabin of off Wears Valley Road when you book "I Don't Want 2 Leave." Stay at this cabin near Pigeon Forge & save 15%! Come stay in this cozy private cabin in the Smokies by Pigeon Forge and Gatlinburg. Book your private cabin rentals online and get immediate SAVINGS with Cabins USA's 15% discount! Come stay at this private honeymoon cabin in Pigeon Forge with the one you love and enjoy a rustic cabin retreat that offers a fireplace, hot tub, and more! Enjoy a memorable mountain vacation on a budget when you book “Smoky Mountain Time,” a discount honeymoon cabin near Pigeon Forge that offers a convenient location and cozy cabin interior. “Top of the Mountain” is a secluded cabin in Wears Valley for the perfect Smokies honeymoon cabin getaway with romantic wood fireplace, hot tub and jacuzzi. Take your sweetheart to this Pigeon Forge honeymoon cabin with views for unforgettable romantic retreat. Features a hot tub, fireplace, jacuzzi, and more! Looking for a private 2 bedroom cabin rental between Gatlinburg and Pigeon Forge, try A Bear Encounter! This is a cabin rental with Internet access. Private cabin called Hemlock Hideaway in Elks Cove Resort. Your Gatlinburg cabin provides family fun with WiFi Internet, hot tub, game room and more! Escape to a private Pigeon Forge area cabin with indoor pool! "Hickory Splash" offers a private 2-bedroom Wears Valley cabin with swimming pool and a 15% online booking discount! Book your very own 2 bedroom cabin in beautiful Richardson Cove only a short drive from Pigeon Forge, TN! Enjoy privacy, 5 star amenities, and a discount! A private cabin with hot tub views. Capture a Smoky Mountain sunset from your private cabin deck in Sky Harbor Resort TN. Rental cabin with pool table. This affordable, secluded cabin near Dollywood offers 2 bedrooms and sleeps 6 guests in comfort. Book this cabin with a hot tub and a mountain view today & save15%! "Just Barely Making It" offers guests a rustic cabin near Pigeon Forge with air hockey table, hot tub, wood-burning fireplace, and more in a tranquil wooded setting! Come experience "Mountain Glory," a secluded 2 bedroom cabin that comes complete with a hot tub, fire pit, and a mountain view near Pigeon Forge, TN! Come stay in our luxury 2 bedroom cabin in Pigeon Forge. Arrowhead Resort cabin with swimming pool access less than a mile off the Pigeon Forge Parkway. Come relax in the Smokies at "A Bear's End," a cozy 2-bedroom cabin off the Pigeon Forge Parkway that offers guests a hot tub, fireplace, and more! "A Twilight Hideaway" offers vacationers a luxurious, private 2-bedroom cabin near Pigeon Forge with a 3-level deck, gas fireplace, hot tub, and more for an unforgettable Smoky Mountain getaway! Come stay at a 2 bedroom cabin nestled in the beautiful Wears Valley area of the Smokies complete with a hot tub, pool table, jacuzzi, and a special 15% discount! Book this affordable, secluded 2 bedroom cabin near Dollywood in the Smoky Mountains and you'll save 15% on your nightly rate with Cabins USA! Secluded private Smoky Mountain cabin rental near Gatlinburg Glades with easy access to Gatlinburg and Pigeon Forge. Private 2 bedroom cabin sleeps 6. Tennessee cabin rental in the Smoky Mountains between Gatlinburg and Pigeon Forge, TN. A 2 bedroom log cabin in a 12 acre Smoky Mountains forest setting. Gatlinburg vacation rental near Pigeon Forge in the Glades Arts and Crafts Community with hot tub and fireplace in a tranquil wooded setting. Online Discount! Book a 3 bedroom Pigeon Forge cabin rental with mountain views, Internet access, fireplace, game room, hot tub, jacuzzi tub, theater room, and more in the Tennessee Smoky Mountains. See incredible mountain views from your very own secluded, luxury cabin in Pigeon Forge, TN. "Lasting Impression" lives up to its name & you'll save 15%! Come experience mountain views in privacy at "Simply Incredible," a luxury 3-bedroom cabin rental on 2 private acres in the Smoky Mountains that sleeps 12. Looking for a private Gatlinburg cabin rental in the scenic Smoky Mountains, try our luxury 3 bedroom cabin called "4 Seasons Gatlinburg." Come stay at this 3-bedroom Wears Valley cabin with hot tub, game room, fireplace, and more on your Smoky Mountain vacation. Welcome to Amazing Majestic Oaks! This dog friendly cabin rental in Pigeon Forge by Cabins USA comes with 3 bedrooms, a hot tub, and a special discount! Book "Campfire Lodge," a private cabin in Wears Valley with luxurious amenities, a fire pit, garage, ping pong table, 3 bedrooms, and sit down arcade game! Welcome to "Cherokee Hilltop," a 3 bedroom cabin rental in Pigeon Forge with a mountain view, game room, ping pong table, skee ball, a hot tub, and more! Experience "Sea of Clouds," an excellent Pigeon Forge cabin near Dollywood that boasts a mountain view, an outdoor fire pit, a hot tub, and a 15% discount! Smokeys Dream Views" is a secluded cabin by Cabins USA in Pigeon Forge! This rental boasts beautiful mountain views and a prime location near Dollywood! Book this budget-friendly 3 bedroom cabin that sleeps 8 in the Upper Middle Creek area near Dollywood, TN! Save 15% with our special cabin discount! "Creekside Cottage" is a rustic 3 bedroom vacation rental in Sevierville that comes with a fire pit, horseshoe pit, and a lovely sport by a creek in the Smokies! 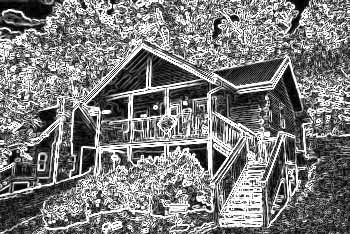 A spacious cabin rental in the Smokies next to the Gatlinburg Glades Arts & Crafts Community in a 12 acre private setting. Come stay at this beautiful cabin by Cabins USA! This 3-bedroom Pigeon Forge cabin rental is one of Cabins USA's affordable Pigeon Forge cabin rentals. Stay at "Above The Smokies," a luxury 5-bedroom cabin that's close to Dollywood Theme Park in Pigeon Forge, TN! Enjoy a theater room, hot tub, and game room! "Bar Mountain" offers guests a chance to enjoy plenty of fun amenities on their cabin stay, such as a game room, theater room, fire pit, and more! Welcome to "Beathtaker," a secluded Pigeon Forge luxury cabin rental complete with a game room, theater room, hot tub, and excellent mountains views! Come experience "Casa Blanca," a beautiful 5 bedroom chalet rental in the Upper Middle Creek road area near Dollywood with a hot tub, fire pit & game room!